I am always looking, looking for creative use of materials, looking for how art can help build community, looking to elicit a smile, an ahhh moment, a time to look at something in a fresh way, like driving down a path always followed and all of a sudden realizing there is another path, or that you have missed something on that daily travelled path, finding deeper meaning, like peeling the skins of an onion back, getting to know things for more than the surface or first impression. I am a proud Canadian, and when I travel I am sure that shows in conversation. I talk about things like “Sun Dogs” and people look at me in dis-believe as I explain how they only occur when it is very cold and it actually looks like we have 3 suns! “What?” and then I am on Google looking for an image to show them. I loved watching people walk into my exhibit, there was always a look of surprise, a “Wow” moment, wow because there were so many images, wow, because the room had such a red glow about it, and wow, when they realized what they were about. Their eyes would dart around, stopping on one that spoke to them from childhood, travels or memories, then over to another, and another. Then it was almost like a scavenger hunt in reverse, finding one they weren’t sure of and guessing as to it’s significance, going to the list for their ahh moment, learning something about our country they didn’t know about, like camels were used during the gold rush, or Flin Elon has sewer boxes where homes are built on solid rock…. It speaks to all generations, kids shows like Mr. Dress Up and the Friendly Giant or the Canadian House Hippo. Grain elevators and red barns that are becoming extinct. Inventions of Canadians, sports, everyday activities, animals, historical sites and the list goes on. I had an on going process of researching images as I painted. I would paint six backgrounds at a time, abstractly red mixed with yellow, the yellow added a life to the paintings. I would draw out an image to size on box board and decide on what areas of it I would cut out to be stencilled in white. Each image has a stencil. When the stencil was done I would look at the abstract backgrounds to see which would work with the image the best, and apply the white paint. When it dried I would add the black details. Next I would make graduated washes of either black or white where I determined they should go and any fine details of black and white. I used stencils as I wanted to learn more about stencilling, I love public art and am inspired by Bansky’s work, I would love to do some art like that, that makes a statement. Public art is so visible and has such possibilities to speak to people. 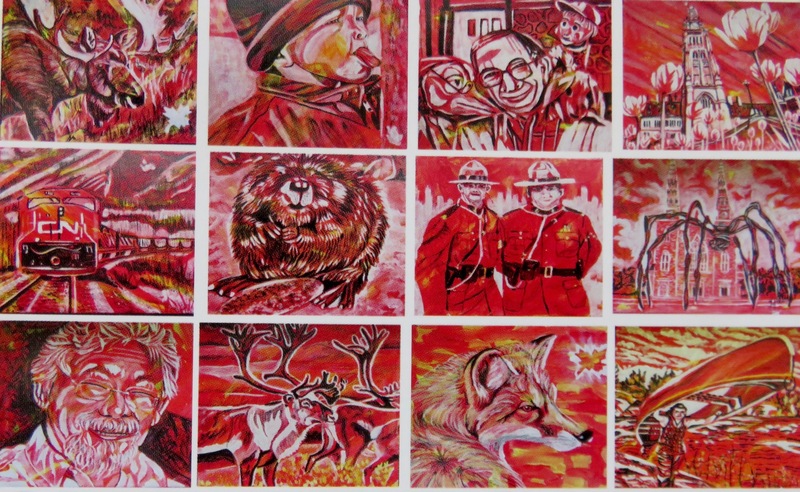 It has been a very fulfilling process creating and exhibiting “Celebrate Canada”, and I have been asked by many where it will be going next, as they really do believe it should be shared across Canada and that is my wish as well. I tried to stay away from portraying our many ethnic groups and famous people, I really wanted the images to speak to everyone as Canadians. We are such a diverse group, on such a large diverse area of the planet. Enjoy.